An excellent budget black USB keyboard with strictly standard AT layout, good key travel and bounce, N-key rollover, drainage holes and highlighted WASD/cursor keys, for only £6.95 from High Street branches of Wilkinsons. Suited to both speed typists and gamers, why worry about Good, Fast, Cheap when this gives you all three? Keyboards are possibly the most important part of a PC for anyone who uses one for more than a few minutes a week. Together with the mouse, they're usually the only bits you actually touch, and for the most part the only methods you have for interacting with the computer. For significant users, a poor keyboard can be a cause of anything from mild annoyance to physical pain or injury. They have a large number of discrete moving parts, often not aided by having foreign material dropped onto them, and a layout which is strictly defined but frequently not observed. So how can Texet get everything so very, very right for 7 quid when so many keyboards, including those two, three, four or five times the price of this model, get things so very, very wrong? As someone brought up on the Commodore 64 and the IBM Model M, I am incredibly fussy about my keyboards. Whilst I would like to buy a Unicomp Customizer or Das Keyboard, with three preschool children I can't justify spending that kind of money (especially when including the extortionate shipping costs to the UK). 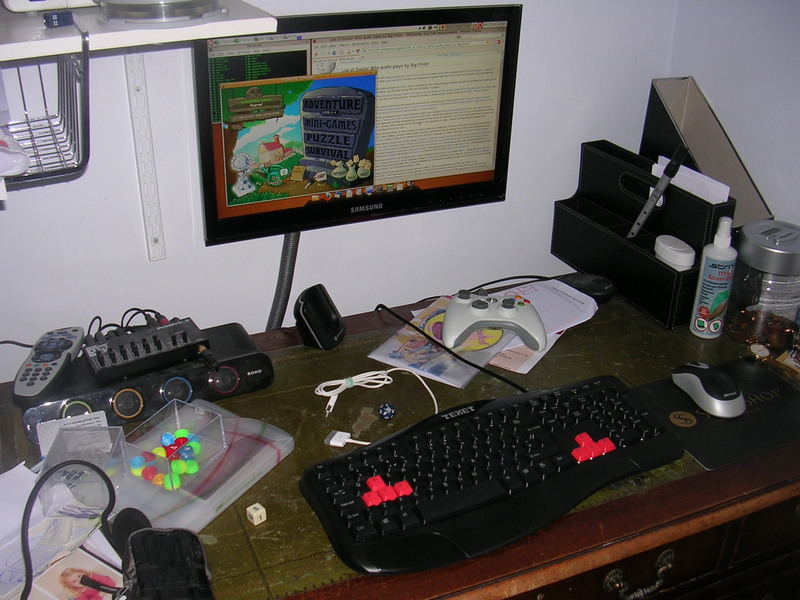 And as someone who uses two or three PCs connected to the same keyboard, monitor and mouse via a KVM switch, I have a choice of either using DVI and USB, or SVGA and PS/2, and I naturally chose the benefits of a DVI monitor, meaning my switch has no PS/2 connection for a second-hand IBM Model M. Whilst some USB keyboards can utilise a dongle to downgrade to PS/2, upgrading PS/2 to USB is notoriously unreliable (whether done with a dongle, or inbuilt into a KVM; it often goes horribly wrong when depressing more than one key simultaneously). My first criteria is that the keyboard must be strictly AT layout compliant. I am, mostly, a touch-typist; I don't look at the keyboard to find keys, my fingers automatically know where to go. This means that any deviation from standard layout massively reduces my typing ability, speed and productivity. There are common no-nos such as moving the Insert/Delete/Home/End/Page Up/Page Down cluster down one row to make way for three power keys whose functions are already available as standard keyboard shortcuts, and then there are much bigger faux pas such as removing the cluster altogether to make the keyboard "slimline" (it's an external keyboard, not a laptop, so why the need to save space?). Add to that some fairly pointless multimedia keys - volume should be set once on a PC and never adjusted; the power-efficient way of controlling the volume is to adjust your amplifier or headphones, thus reducing actual power consumption at the same time; play and pause is mapped by default to the spacebar so what else do you really need? The Texet WK-408 meets the AT layout standard exactly. True, the Microsoft Windows key could have a more neutral logo (such as the Asus Eee's "Home" key), given that I mainly use Linux, but this is a minor quibble. 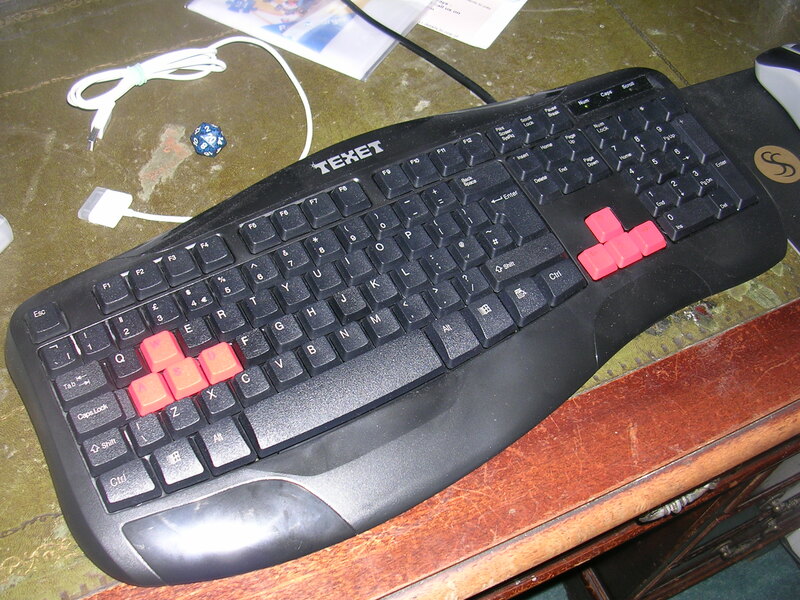 Whilst the rest of the unit is black, the cursor and WASD keys are red, highlighting common keys for games. I do a fair amount of gaming on both Linux and MS-Windows, and I found the highlighted keys helpful when switching between joypad and keyboard in low light. At worst these coloured keys are certainly not a distraction for lengthly touch-type programming or blogging sessions. Next on my desirability list is key travel and bounce. A key should have just the right level of sprung resistance, it should be light to the initial touch, depressing down far enough to give a good sense of engagement, with the resistance increasing as the key reaches the bottom of the travel. This provides tactile confirmation that the keypress has registered, without the need to closely watch every character appear on the screen. A good typist can not only type without looking at the keyboard, but also without looking at the display; one should be absolutely confident, by feel alone, that the keypresses have worked. My previous Genius KB-06XE was dreadful in this regard; a squishy, muddy mess that resulted in both far too many mistakes and far too much re-keying. 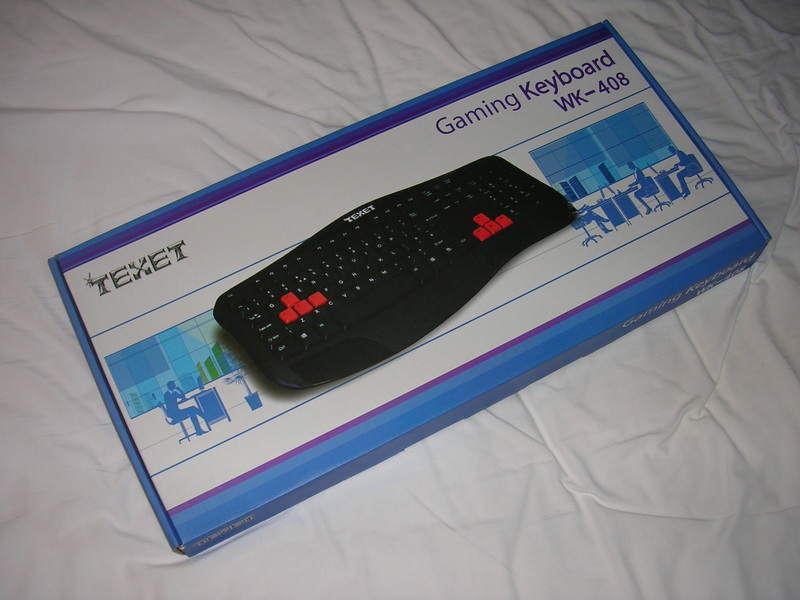 The Texet WK-408, however, has some of the best key travel I've seen in a budget keyboard, equivalent to or better than a post-IBM Lenovo or Dell business keyboard. It's not buckling spring - it has only a little click-feel and almost no noise - but it is pretty good. With layout and feel done right, at £7 this keyboard needed to do nothing else to impress me, but in the words of an infomercial, "but wait, there's more". N-key rollover is increasingly being touted as the must-have feature for a gaming keyboard. This refers to the number of keys which can be held down simultaneously whilst still producing correct input for the computer. For example, in a gaming scenario you may wish to remain crouched whilst simultaneously moving and changing weapon, perhaps with a side order of pulling up some information from the heads-up display. The Texet supports up to 6 simultaneous key presses. I have also noticed that N-key rollover keyboards are better for speed typing, seemingly handling rapid-fire scenarios where an initial key may not have been fully released before second or third keystrokes begin; although this problem may be due more to my lazy self-taught speed typing skills and mild arthritis than any other real-world scenario. Wrist-rests are very much a personal preference, and indeed it is a minor downside that the Texet one can't be removed, but it is pretty good. In particular, there are smooth areas dedicated for the cursor and WASD keys which actually do make gaming more comfortable, and textured areas for the rest of the board. Again, this helps orient the hand and fingers to the keys by touch, without the need to look at the keyboard. Another significant feature is drainage. The board incorporates numerous small drainage holes under the keys, visible underneath the unit, which claim to reduce the damage that a liquid spill would make. I haven't tested it, but the idea seems sound and the implementation sensible. Finally, I didn't measure the cable length but it was somewhere between more-than-sufficient and generous. Downsides? Well, the bulging TEXET logo won't appeal to many, it is barely even known as a budget brand (having said that, they should be rightly proud of this model). It comes in any colour you like so long as it's black, which is fine for those of us with Antec Three Hundreds or any of a number of modern black cases, less so for old school cream purity or those in the silver/white/glass coloured-pencil-department. The styling is distinctly curvy and organic, unlike the angled lines of Das Keyboard or Lenovo, with a hint of Microsoft Natural to it (although the key layout itself is reassuringly rectilinear). The WK-408 is also fairly ostentacious in size; a full-sized keyboard with a non-detatchable wrist rest, this is not something you're going to be able to easily move out of the way if you want to use your desk for a spot of origami. All in all, this would be a good keyboard at £15-£20, but at a few pennies change from £7 plus the fact that you can just stroll along the High Street and buy it at Wilko, thus saving postage fees, places this firmly into no-brainer bargain territory. Buy one now and buy another as a spare, since if there is any justice in the world, stock should run low.